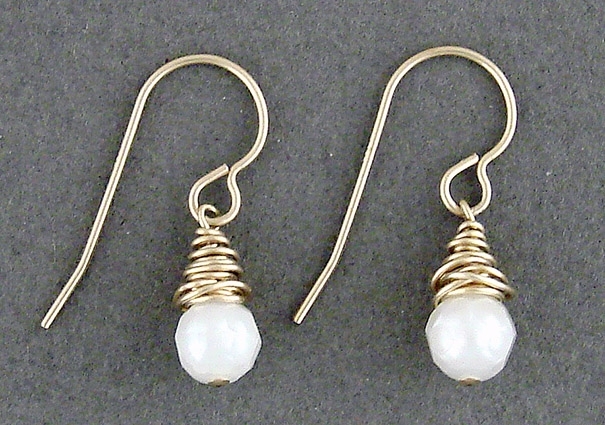 From J & I Jewelry - Faceted White Pearls wrapped in 14k Gold Filled wire Earrings. Wire findings are 14k Gold Filled. Each earring measures approximately 1" long x 1/2" wide. Pieces typically ship in 2 to 3 weeks. If time is essential, please contact us and we will be happy to let you know what is available for immediate shipment. Note: Many items are in stock and available to ship within 24 hours. Gold filled provides the color and luster of solid karat gold while keeping costs down. People often confuse Gold Filled with Gold Plate. Gold plate is a relatively thin coat of gold electro-plated over a base (non-precious) metal. Whereas, Gold Filled is made by mechanically bonding a much heavier layer of KT Gold over the base metal. J & I Jewelry is designed by Ian Gibson and manufactured at his studio in Philadelphia, Pennsylvania. All designs are original, fabricated from sterling silver and gold filled metals. Each individual piece of metal is cut, shaped and textured to form a variety of patterns used in the formation of J & I's stylish jewelry. With utmost attention to detail, gemstones and pearls are often added to produce Ian's unique and innovative designs.